How do you describe your work, Paul? My work is generally elegant and simple. Symmetry and pattern are the two elements defining most of my jewelry. 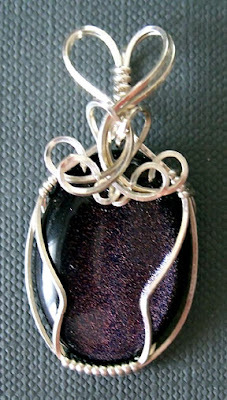 My focus is on wire work and the use of quality gemstones. I'm not a person that has an artist statement unless "Stuff happens" is valid. I have no real theme to my designs. Whatever appears on my table is usually unique or in small quantities. My worktable doubles as my computer table, so my jewelry stuff needs to be quickly moveable. It sits in various stackable containers, sorted by type: gemstones, non-gemstone beads, boxes of findings, gold, silver, copper, stringing material, chain. Inside the containers, everything is separted again by stone, finding type, etc., all in numbered bags. When I'm working, all of these containers are arrayed around my workspace and I just grab the bags I need as I go. The numbers correspond to the database I use, so after making a design, I quickly write down the bag numbers. Pricing work is a separate event from creativity. When I price, I take the individual jewelry articles and count the use of each design material and determine the price. Music is always playing when I'm creating. I haven't noticed if the music affects how I create. The type of music doesn't matter much. I play everything except rap and twangy country. Those are just not my favourite genres. I don't always use a recorded design element. That is, it isn't always on paper. Sometimes I know what I want to use, and I play with it and other materials to see what happens. Deliberate design on paper is often very minimalist and abstract - a curve presenting stringing/chain material and shapes for beads I know I have for necklaces and bracelets. I don't always think in colour; that happens later. Simple earrings are always done spontaneously. Wire work often starts as a design to be sure I haven't tried to plan an impossible object that can't be rendered in three dimensions. The rule about symmetry doesn't always work for my wire-wrapping. My wire-wrapped hearts never have a design for the decorative portion on top. That happens wherever the wire wants to go. Sometimes I enforce symmetry on those objects and I like the result even if I didn't get a curve to match perfectly or a loop the same size as it's supposed twin. When I sit to make most jewelry, I do it in large chunks of hours, making at least one item at a time. It is rare for me to start a piece and lay it aside to be completed unless I need a specific item for it. When I'm doing something simple like creating single drop earrings, I might work in small lots. Often I put those materials and needed tools in a small box and take it with me to fill time away from my table. I have learned for wire-wrapping that making similar items in batches in specific steps is usually easier on the hands. 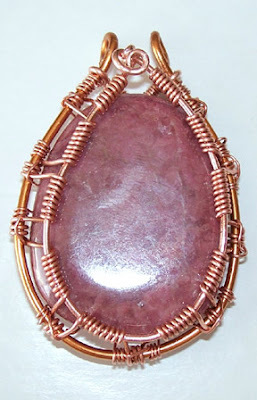 Select the stones; make the wire harness; wrap off the harness with the stone in place; do the free-form design. If I don't do it this way, I'm repeatedly stressing my fingers as I make the wraps tight, and then trying to make the interesting decorative part with tired fingers. All that seems like a lot of process, but it minimizes my time in the long run. I don't call myself a professional. 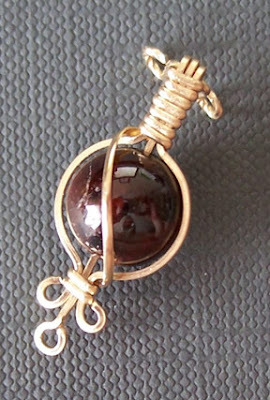 I took one class in wire jewelry-making and another in wire-wrapping to learn the basics. For jewelry without precious metal wire, I learned from "the basics" sections of magazines or jewelry-making books. I learn the technique and apply it, simple as that. The "rules" of symmetry and patterns come from my love of mathematics, which is what I majored in in university and played with my entire life. It was rare if I took a bunch of building blocks and created something that was assymetrical or unpatterned. I like those aesthetics. For wire-work, it's very object-based. I look at interesting shapes and wonder if I can replicate it in wire. Once I've accomplished that, I look at design variations. Often the objects that generate the most interest hold something else, since most of my wire wrapping is around a gemstone that must be kept in place. For all of my jewelry, it's the play of colours, shapes and patterns. Since this is a money-making hobby, it rarely is frustrating on a large scale. It's what I do to relax. Those are the few projects I put down to be completed later. I write down the design I have so far and keep the incomplete design where I can easily see it and let time and other jewelry making fill in the gap until I have a "Eureka!" moment. what I have already created, or at least pictures, and looked through them. I read books on creativity and went through my favourite jewelry books, just looking at pictures. I reflected and wrote about what made it tough. I look up resources for technique to see if I'm going something wrong. I also arranged to be at a simple craft fair. I didn't make any new items for it since I had a lot of old stock. The act of being in sale mode and the enjoyable chit-chat with people about my work was inspiring. Spring's arrival also helped my mind-set. Learn techniques one by one. Decide what you'd like to make. Pick a technique you need to make that and learn it. Do this until it becomes so familiar to you that making objects using it is easy but not yet boring. After that, learn the next technique that will enhance that particular one. Don't take on too many techniques at once, or too many different types of jewelry making. Otherwise, your work will improve very slowly as you use more techniques but focus on them less. have decided I do not know enough about wire work yet. My full-time job, and reading and writing keeping up with friends. What's your favorite comfort food and other favorite things? Purple is my favourite colour. I have 10 metres of purple linen cord that I want to do something with but I don't want to cut it. My favourite comfort food is hard pretzels with a little mustard. I know I'm ready to stop being comforted and work on jewelry again when I imagine stringing them together or connecting them with jumprings. Cyndi: Thanks for the feature. My desk is covered with projects I want to get up onto my website by the first week of May. Off we go! stunning beads! i love the very first one...the green bead...great work! Paul, thank *you* for sharing your lovely work and your knowledge! 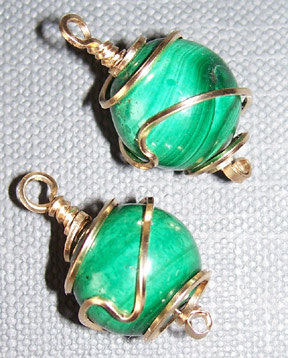 These are actually gemstones, and only the green stone you like and the dark red stone is drilled for stringing. That one is malachite. Next are a blue goldstone cabochon, a quartz crystal, garnet, and rhodonite.